Evenings are usually the best part of our day- coming home and being enveloped by its warmth and coziness. Especially in the winter, when the weather calls for lighting the fire in the hearth or turning the heating up a notch and getting the rooms cozy and toasty. There’s nothing more inviting than snuggling up on our beds or sofa drinking hot cocoa or coffee, embraced by the warmth of a soft, comfortable and indeed luxurious bed throw or a blanket. Most people juggle between choosing a bed throw or a blanket, and although both has a common denominator- keeping us warm, each has its own features, uses, advantages and disadvantages. Knowing what we need and what we can benefit from each are the key factors. We have already written a complete guide about best Electric Heated Blankets. Some of you may ask, aren’t bed throws and blankets the same thing? No. Blankets, in general, are bigger than throws; big enough to cover the whole bed, they’re a part of your bedding, and are usually placed at the foot of your bed, folded or used a s bed spread.Bed throws on the other hand, are the younger, more colorful siblings of blankets. They are not designed to cover the whole bed but rather, small enough to wrap them around you likea shawl, but big enough to cover you from the neck down to your feet,andcan be worn even outside the bedroom. When it comes to color, materials, patterns and designs, both blankets and bed throws come in a variety of vivid colors and durable but very soft materials to give you that luxuriously warm feeling. However, bed throws often have fringes or tassels, they have trendier patterns and their designs are more stunning. Thus, other than keeping you warm, they can also be used as wall hangs and as room accessories to add accent to furniture and/or décor. 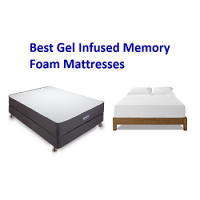 Check out our complete guide about best Heated Mattress pads. Bear in mind that there are no perfect blankets and bed throws, but you could find one that would suit your needs and wants perfectly- don’t just go for the looks and the design, there are essential factors to consider before you make your purchase. What kind of fabric do you prefer? Smooth? Fluffy? Extra warm? Do you live in a place where it’s extremely cold? Cotton – these fabrics are natural fibre, comfortable, lightweight and breathable. They’re perfect for everydayuse, can be washed frequently. These fabrics are perfect for warmer climates. Wool – these are fabrics made from the fibers from the fleece of lambs, sheep, and goats. They are breathable, and can keep you warm enough during the cold season. Fleece – blankets and bed throws made from these are not really heavy and thick, but can give you more than adequate warmth. Synthetics – they are mostly polyester and acrylic. Polyesters are durable, resistant to stretching and shrinking, can be easily washed and dried, wrinkle resistant and extraordinarily warm to use. Blankets and bed throws made from these fabrics are perfect for those extra cold winter nights. Cashmere- these fabrics are produced from high quality wool of a goat, they are fine and soft and has a rich and luxurious feel. They are lightweight and can keep you perfectly warm. These fabrics are usually dry clean only. Linen- these are fabrics made from the fibers of the flax plant. They are absorbent, quite cool and are perfect for warm weather. Alpaca – these fabrics are made from fleece harvested from an alpaca. Depending on how they are spun, these fabrics can either be heavy or lightweight. These fabrics are soft, silky and durable. This rich wool soft and silky and are quite effective in keeping you warm. Down – these blankets are made of two layers of fabric with down feathers between them. They are light and thin but can surely keep you warm. Bed throws and blankets come in different sizes. 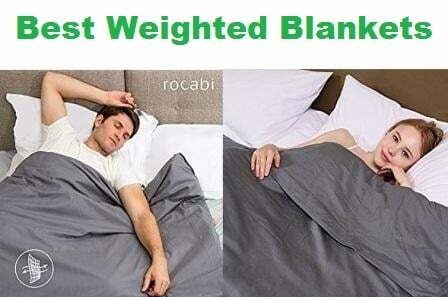 A suitable blanket is one that fits you and/or yourbed perfectly. A blanket that is too short may prove to be uncomfortable, on the other hand, a blanket that is too big will just trail too far down the bedsides. Blankets come in different sizes- California King, which is extra-large, King, Queen, Double/Full, and Twin. Measure your bed and make sure that there is enough to drape both sides and the foot of the bed. Bed throws are smaller versions of a blanket, although they also come in different sizes. Depending on the fabric and weave types, blankets and throws have different warmth levels. Choosing the fabric and weave according to the current season is important, cotton is suitable for warmer climates while wool, fleece and synthetic blankets are perfect for colder months.Another important factor to consider is moisture wick- moisture wicking fabrics prevent the build-up of heat and moisture. Fabrics such as cotton, wooland silk are more breathable and they keep you warm, while synthetic materials are well-suitable for extremely cold months. Make sure to choose hypoallergenic blankets if you are allergic to micro fabrics. You can also choose fabrics that you can wash with warmer/hot water to effectively get rid of allergens. Your blankets and bed throws will last longer if you know how to care for them and keep them clean. Makesure to check the labels for the washing instructions, some fabrics are dry clean only, some should be hand washed, while others can be machine washed. Cashmere is incomparably luxurious, soft and warm. Pure Cashmere Throws are made from 100% pure cashmere, this lightweight throw is made with 4 ply cashmeres and is just the thing to keep you warm and in stylethese coldmonths. Its richBurgundy color is a touch of elegance and would be perfect for anything you wear, as well as add a touch vibrance to your home when used as a home decor. Pure Cashmere throw is made from 100% pure, 4 ply quality cashmere and weighs 600 grams, and unlike other cashmere throws, it is slightly heavier and can double up as a light blanket. This 52-inch by 72-inch Burgundy throw is exceptionally fine in texture, ultra-soft andnot scratchy, it’ll give your skin a greatfeeling when you wear it. Pure Cashmere Throws come in a variety of solid and attractive colors: Burgundy, Camel, Crimson, Espresso, Mocha, Sage Green, Spring Green, Vanilla, Charcoal, Faded Pewter, Rose Petal Pink, Blue Topaz, Burnt Orange, Tanzanite, Black and Earth Grey. You have a wide array of vivid colors to choose from to match your style and fashion. Cashmeres are known for their lightness but great insulationcapacity- Pure cashmere throws are perfect for maintaining body temperature and keeping you warm. They are not bulky and thick so they are easier to carry around anywhere. These gorgeous throws can retain their shape and does not shrink even after repeated washings. They are durable enough to last you foryears. Pure cashmere throws have that elegant and classy look plus the 4-inch straightfringe on both ends give it that extra charm. 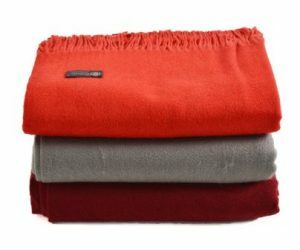 Unlike other cashmere throws, Pure cashmere throws are made from 4-ply, 100% high-quality pure cashmere so you’re sure you are getting the real thing. Like most quality cashmeres, Pure cashmere throws are durable, but you may want to be a little gentle for them to last you a very long time. Most cashmeres are labeled dry clean only, but you can opt to hand washit with mild detergent and do not wring the fabric. For machine wash, use cold water and delicate cycle, you can also consider placing the bed throw in a mesh bag to prevent snagging and tangling. Luxuriously warm, plush, cozy- is how the Double Sided Faux Fur Throw Blanket Silky Soft Oversized Afghan will make you feel. This silky soft and dense faux fur has the look and feel of a real fur. This light grey fox and chinchilla stripe faux is a double sided faux fur guaranteed to give you the warmth you need this season. 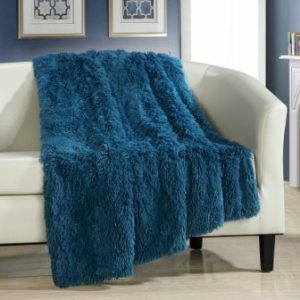 The Double sided faux fur throw blanket is made from high-quality durable100% Polyester that would last you for years. This plush and deluxe faux fur blanket throw is of an elegant shadow light grey fox and chinchilla stripe on both sides. The Double Sided Faux Fur Throw blanket measures at 56 inches by 69 inches, medium weight- not too light and not too heavy, and long enough to cover you and keep you warm. 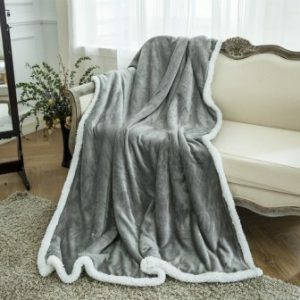 This posh blanket throw has a medium short, thick faux fur pile that’s lavishly soft and lush and comfortable on your skin, and can definitely keep you warm even on the coldest seasons. The Double Sided Faux Fur Throwblanket is stain-repellant, you can be sure that it would maintain its luxurious, plush and glamorous looks for years. This extravagantly rich bed throw is perfectfor gift giving, especially this holiday season, and as an added feature, it comes with a storage bag and a festive ribbon wrap. 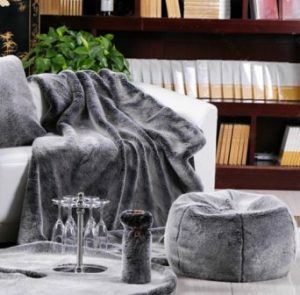 Compared with the competition, Eikei’s ultra-soft double sided faux fur throw blanket has the look and feel of a real fur, it is extra-large and can cover you comfortably. It is thick enough to keep you warm but not too heavy. It is stain-repellant and does not shed. 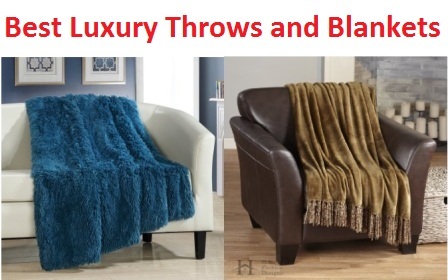 The Double Sided Faux Fur Throw blanketis machine washable and air dry-able. To preserve the posh and soft feel of this blanket throw, please tumble dry on LOW or Air fluff only, NO to fabric softeners to avoid stripping off the luster of the fabric. Tekkell’s luxurious and breathable Cotton Throw Blankets are made from 100% Turkish cotton and are ideal for indoor and outdoor use. Thisdouble sided comfortable blanketiswarm enough to use for picnics, dinner at the patio, open air movies and more. It wouldmake an excellent home accessoryas ithas an attractive design, its classic Black color and geometric patterns would surely complement your home decors- drape them on your armchairs, couch, lounge chairs or use them as bed covers. Tekkell’s cotton throw blankets are handmade using 100% high quality and durable Turkish Cotton, they are breathable and warm enough to keep you cozy and comfortable. These premium, and ultra-softcotton throw blankets come in six neutral colors- Navy Blue, Dark Grey, Grey, Brown, Beige, and Black, each has a stunning geometric pattern that forms diamond shapes and charming twisted handmade tassels for an added touch. Tekkell’s cotton throw blankets measure at 96 inches in length and 84 inches in width; it is extra-large, big enough to keep three adults comfortable, cozy and warm. These handmade cotton throw blankets are perfect to use for those chilly nights, they can warm you up even outdoors. Tekkell’s 100% pure cotton throw blankets are breathable and Hypoallergenic, they are fabulously smooth and soft and safe to use even for those who have sensitive skin. They come in an elegant white packaging, and would make a perfect gift for your loved ones. Tekkell’s luxurious and breathable Cotton Throw Blankets are ideal for both indoors and outdoors use, they are big enough to comfortably warm up three adults, and compared with the competition, Tekkell’s handwoven throw blankets are hypoallergenic and made with 100% pure Turkish cotton. Tekkell’s 100% Cotton Ultra-Premium Natural Soft Hypoallergenicblanketsare pre-washed and will not shrink when washed. You can wash it in any setting preferably in delicate setting with cold or warm water and use hot water only if you have to (If there is a stain or something). And you can dry in low or mid heat without any problems. Winter seasons are always exciting, we anticipate the coming of the holidays and festivities. During these colder months, we need the extra warmth of a soft, comfortable blanket or throw. The Tahari Mink Faux Fur Throw Luxury Silky Soft Blanket is made from premium faux fur, plush and soft, perfect for snuggling under on the sofa, its rich, fluffy feel would give you the warmth you need. This rich and fluffy blanket throw would make a great accent to your home décor- posh and elegant Faux fur on one side and plush poly velvet velour on the other. It comes in five attractive neutral shades- Grey Ice, Ivory, Taupe, and Brown. The Tahari Mink Faux Furmeasures 50 inches by 60 inches- big enough to envelope you in its warm, silky softness. The Tahari Mink throw blanket is made from plush, soft and warm100%faux fur on one side and silky poly velvet velour on the other side. Its medium thick design and sufficient size is just what you need for exceptionally cold weather. Compared with other leading Faux fur blanket throws, the Tahari mink faux fur is made from 100% faux fur and posh and elegant poly velvet velour, it is big enough to snuggle under for comfort and warmth. It is easy to maintain its plush and fluffy look as it is machine washable. Tahari Mink Faux fur is machine washable, easy to care for and maintain its softness and attractive looks. The Cable Knit Sherpa Oversized Throw Reversible Blanketis one of the coziest, classiest-looking reversible blanket in the market. This soft and warm Sherpa blanket is made of high quality cotton blend- Cable knitted in an attractive sweater pattern on one side and Faux sheepskin on the other. This medium weight blanket is ultra-soft and warm and long enough to cover your feet- perfect for snuggling under on your bed or sofa during those long chilly nights, great for gift giving on any occasion. This classy looking Sherpa blanket is made from a blend of high quality cotton and acrylic on one side and Sherpa lined on the other, whichever side you use will keep you cozy and warm. This plush and reversible blanket is Cable knitted in a classy and attractive sweater pattern on one side and Fauxsheepskin lined on the other. This elegant looking and exceedingly soft and warm blanket comes in three gorgeous shades- elephantgrey, off white and teal andturquoise blue. This cable knit Sherpa throw blanket measures 55 inchesby 70 inchesand is medium weight, not too heavy and not too light, its size is enough to snuggle under on your sofa or bed. This reversible blanket throw is double lined, Cable knit and faux sheepskin, medium thick and soft to keep you extra warm. The Cable Knit Sherpa Oversized Throw Reversible Blanket, unlike the competition, is not too thick and heavy but can you the comfort and warmth you need during the cold months. Caring for this classy reversible Cable knit blanket throw is easy as it is machine washable and dryable. The Luxury Fleece Super Soft Thermal Blanket is a plush, attractive and elegant blanket that’s not only suitable for indoor use but for outdoors too. Made from high qualitymicrofiber, thisextremely soft and lightweight thermal blanket is ideal for use in all seasons, great for camping, watching outdoor movies, as bed covers, travels and more. It would be afine addition to your home and also perfect for gift giving. The Luxury Fleece Super Soft Thermal Blanket is made from 100% Microfiber- high density Polyester with super fine fibers, they are thick but light in weight. The Luxury Fleece Thermal blanket comes in fourdifferent sizes- Twin, Queen,King and travel size, at 330 GSM (Grams per Square Meter) it is light in weight, but will give you the cozy and warm feeling you want. Thisplush and warm thermal blanket thick and lightweight and guaranteed to keep you warm even on colder seasons. The Luxury Fleece Thermal Blanket is multi-function- great as bed covers or as an additional layer for your beddings to keep you extra warm, attractive enough to drape on your couch or armchairs, it is also ideal for travelling, camping and other outdoor activities. It has the all the sizes to fit everyone- men, women,kids, toddlers and babies. It is hypoallergenic and shrink resistant and will not shed easily. Caring for this plush thermal blanket is easy- Machine washable, gentle cycle with cold water. DO NOT tumble dry. Experience luxuriously soft and comfortable warmth with the stunning Luxury Sherpa Throw Fleece Blanket Faux Fur- this luxuriously rich and silky-smooth fleece blanket is lightweight and is perfect to use for all seasons. This posh microfiber blanket is durable yet gentle enough on your skin. The Luxury Sherpa Throw blanket is great to snuggle underon extra cold nights and chilly mornings- plush and thick enough to give you warmth but light enough to keep you from sweating. The Luxury Sherpa Throw Fleece Blanket Faux Fur is made from high-density 100% Polyester with ultra-fine fibers on one side and fluffy Sheepskin fur on the other. 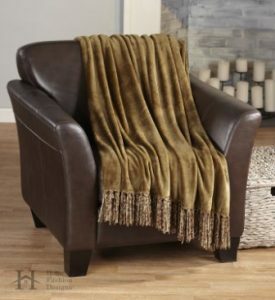 This microfiber blanket throw is soft and durable with fine and sturdy stitching. 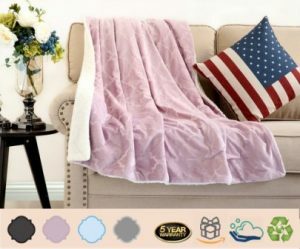 This super fine and lush Luxury Sherpa Fleece throw blanket has a delicate and charming Candy Pink shade perfect for your kids’ daybed, toddlers bed and baby’s crib. Its extra soft and smooth microfiber fabric has an attractive embossed pattern on one side and Sherpa fleece on the other. This throw blanket will look great with your home décor and has a variety of gorgeous vivid colors to choose from: Sky Blue, Candy Pink, Dark Grey, Silver Grey, Warm Grey, Ice Green, Ivory White, Pirate Black and Wine Red. The charming and plush Luxury Sherpa Fleece throw blanket measures at 60 inchesby 80 inches- suitable for daybeds, toddler beds or nursery bed blanket. It comes in two different sizes- Twin, 60 inches by 80 inches and Travel size, 50 inches by 60 inches. This snuggly and warm Sherpa throw blanket is thick yet light enough to give you cozy warmth during cold seasons. 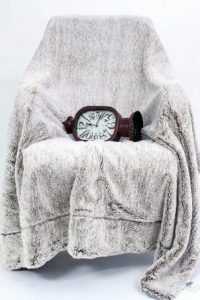 The Luxury Sherpa blanket uses individual spindle drives technology in winding along with ring Spun Yarn- this technology makes this blanket durable and less prone to shedding, it uses environmental protection techniques and makes the fabric keep its color and prevent fading. This throw blanket is hypoallergenic, so it is safe and gentle to use even on baby’s skin, it is dust mite resistant,anti-static, doesn’t shed, fade or shrink. 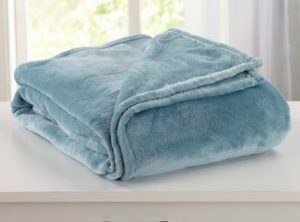 The Luxury Sherpa Fleece blanket throw is machine washable- wash with cold water on gentle cycle. Tumble dry at low heat. Do not iron. Hypoallergenic, dust mite resistant,anti-static, doesn’t shed, fade or shrink. 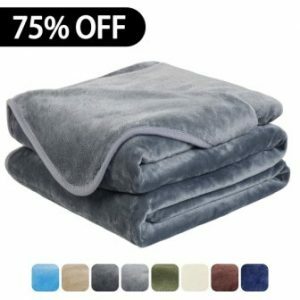 Stay extra warm and cozy this holiday season with the perfect winter blanket-the Ultra Velvet Plush Fleece All-Season Super Soft Luxury Bed Blanket, this top quality, ultra-plush and warm blanket is made from high quality 100% Polyester. This luxuriously soft and velvety blanket is thick but lightweight and breathable, perfect not only for the coldest months but all year round. The Ultra Velvet Luxury blanket by HomeFashion Designs is made from high quality 100% polyester and is plush and luxuriously smooth and warm. This plush and comfortable blanket comes a wide variety of solid and vibrantcolors: Taupe, Silver, Smoke Blue, Latte, BlueSurf, CappuccinoFoam, DesertSand, Eggnog, GreyMorn, Harbor, Indian Teal, Muted Clay, Pewter, Sky Grey, Steel Grey and Whisper White. You can choose which from these attractive colors will blend perfectly with your home décor. The Ultra Velvet Luxury blanket has various sizes available- Twin: 66 inches wide by 90 inches long; Full/Queen: 90 inches wide by 90 inches long; King: 102 inches wide by 90 inches long, perfect for all bed sizes. The Ultra Velvet Plush Fleece All-Season Super Softblanket is thick and warm, and at 300 GSM, is super lightweight. This durable and breathable plush blanket is perfect for the winter seasonbut is an all-seasons blanket. It can give you the extra warmth you need without sweating. This velvety smooth blanket is machine washable and does not shed. Caring for this soft and plush blanket is easy, it is machine washable and dry-able. One of our home essentials are beddings, blankets and throws, especially during these cold winters months. Is there anything more comforting than snuggling under a warm and soft blanket by the fire sipping coffee or watching a movie? H. Versailtex’s Lightweight Fleece Blanket, is a super soft flannel blanket that is cozy and warm, perfect for cold evenings and chilly mornings. Its warm Camel shade will blend easily with your home accessories. It’s great for outdoors use too and an ideal for gift giving any time of the year. This soft and lightweight flannel fleece blanket is made from high quality and durable materials, it is breathable but thick and warm. Versailtex’s warm and fuzzy bed and couch blanket have a simple and classy design- they come in solid and warm colors; Navy, Ivory, Burgundy, Grey, Brown, Camel, Duckegg Blue. 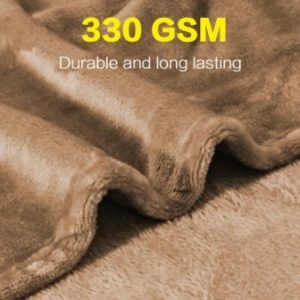 This luxurious and thick blanket has a soft and smooth surface that will give you that warm and comfortablefeeling, it is extra thick and at 330 GSM, it is super lightweight. This micro plush blanket is excellent for cold winter nights. Versailtex’s super soft flannel bed and couch blankets are Hypoallergenic- gentle even for baby’s skin, they are wrinkle and fade resistant, they don’t shed, shrink-proof, Vinyl and formaldehyde free. Compared with other popular blankets in the market, these blankets are guaranteed not to shed, they will not shrink when washed. To maintain the fabric’s softness, machine wash with cold wateron gentle or delicate cycle. Tumble dry on low heat. Avoid direct heat. Do not bleach and do not iron. Fall and winter are the coldest months of the year, tis the season for merry making and snuggling with a warm blanket- what better way to be comfortable and warm than to have this Super Luxury Faux Fur Blanket Throw from Christie’s Home Living. This cozy fuzzy blanket is luxuriously soft and warm. Itssolid neutral color will blend easily with your home decors. These blankets are perfect to use as bed blankets, an added layer to your beddings, or a throw, they are lightweight and easy to travel with. Thisplush and remarkably warm blanket is made from durable and high quality100% Polyester. This warm and plush blanket throw comes in a warm neutral color- Grey. This fuzzy blanket measureat 59 inches by 79 inches. This super luxury faux fur blanket is perfect for snuggling under on winter evenings and chilly mornings. This ultra-warm blanket does not pill, so it’s safe to wash along with other items. You can hand wash or machine wash this blanket- wash gently with cold water, tumbledry on lowtemperature. Do Not Bleach and Do Not Iron. Liven up your homes with the stylish and elegantly designed CaliTime Super Soft Throw Blanket- this luxuriously rich and soft bed and couch blanket isso fluffy and soft and will give you the comfortable warmth you need. This thick and light weight plush throw blanket have the most amazing designs and shades and will definitely look great with your home decors. This throw blanket can be used as a shawl, an extra layer of bedding, a blanket and more. It’s perfect to use in any season and great for gift giving too. This plush flannel fleece is made of high quality and durable 100% Lightweight Microfiber Polyester. It has ultra-fine and super soft fibers that feels good to the touch. This impressive and fabulously designed flannel fleece blanket comes in a variety of colors and designs- all equally elegant and stunning- Dragon and Phoenix Series comes in Chinese Red, Eggplant, Navy Blue, and Teal.Peacock Feathers Series- Gold Grey, and Teal Grey.Polar Bear Series- Navy Blue,Red, Grey, and Teal Grey. The hombre design, Quatrefoil Series- Grey to Blue, Grey to Purple, Grey to Red and Grey to Teal.And there’s the Purple Leavesdesign and Sunflowers design. This amazingly warm and thick bed and couch throw blanket measures 87 inches by 87 inches. It also comes in a variety of sizes to fit your beds; Throw size60 inchesby87 inches, Full size71inchesby87 inches, Queen size 87 inchesby 87 inches and King size 102 inches X 87 inches. 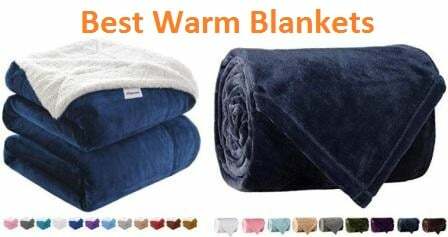 This Super Soft warm flannel fleece throw blanket will keep you warm and snug during the winter and are ideal to use during the summer and fall seasons. They’re perfect for travel and camping and other outdoor activities. This couch and throw blanket does not and will maintain its plush even after washing. Manufacturer stronglyrecommends to wash the blanket before the first use, add proper quantity of softening detergent to avoid static. Washing Instruction: Machine wash cold separately. Gentle cycle only. No bleach. Tumble dry low. Do not iron. Winter season is about Christmas shopping, presents, rushing home to the warmth of smooth and plushy blankets and posh and warm velvety bed throws- from Home Fashions Designs comes this stunning and gorgeous addition to your favorite cuddling blankets, Raya Collection’s Ultra Velvet Plush Soft Blanket. This rich and deluxe throw blanket would also make a perfect addition to your living room, bedroom and family rooms. It comes in a wide variety of attractive colors to choose from- just the thing to give away as presents for all occasions. This ultra-plush warm throw blanket is made from high quality and durable Polyester and guaranteed to keep its plushy velvety looks even after several washings. Theseultra-velvetplush soft throw blanketscome in solid vibrant colors with an elegant decorativefringe for that added charm and style. You can choose from these bright and stunning shades; Marsala Red, Smoke Blue, Simply Taupe, Steel Grey, Mocha or Eggnog. 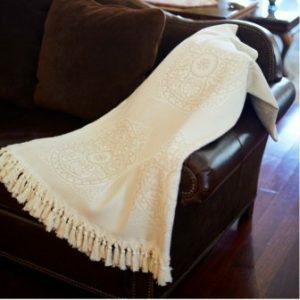 This warm and comfortable blanket throw measures 50 inches by60 inches, the perfect size for a throw blanket. Staying warm and cozy is easy with this top quality smooth throw blanket, at 300 GSM it is so lightweight but warm enough for those chilly evenings. Caring for this velvety sooth warm blanket throw is easy- it is machine washable and will never fade even after several washings. The LANGRIA Luxury Sherpa Flannel Fleece Blanket is the perfect choice when you want to snuggle under the warmth and comfort of a velvety smooth plush blanket on those cold winter nights. This reversible, double-sided cozy blanket is great for travel, as bed cover and for gift giving as well as an added stylish accent to your home decors. The Langria Sherpa flannel fleece blanket is made from high quality 100% polyester microfiber and is so durable and lightweight- 280 GMS flannel sideand 220GMS plush Sherpa side. This super soft reversible blanket comes in solid and vivid colors to match your mood: Wind, Grey, Camel, Navy Blue, Dark Grey, Yellow, Sky Blue, Wine, Blue, andCamel. This lightweight double-sided blanket is ultra-warm and ideal for indoor and outdoor use. This posh blanket’s fabric is colorfast and will never fade. It comes in its own compact zipper bag- perfect for travelling. Posh and chic is how you would describe Chic Home Elana Faux Fur Throw blanket- this smooth and plush throw blanket is so luxurious and comfortable to snuggle under with. This fashionable and stylish throw is reversible- shaggy faux fur on one side and plush micro ink on the other. it would make an elegant piece of home accessory or give it to someone this holiday season. 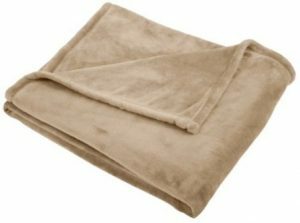 This plush and buttery soft throw is made with premium quality plush faux fur on one side and the backing is made with high grade micro mink velour fabric. 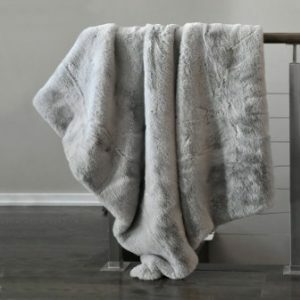 This comfortable throw can you keep you warm but not too hot- super soft faux fur and silky-smooth micro mink fabricthat’ll be great on chilly evenings. Caring for tis plush throw is easy- it is machine washable with cold water on gentle cycle and use mild detergent. When it comes to choosing which throw blankets have the smoothest, finest and most comfortable feel, Pinzon Velvet Plush Throw Blanket is among the tops favorites. 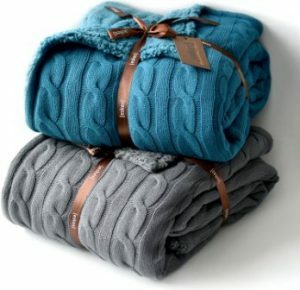 This blanket throw is ideal for warming you up during the fall and winter months- the coldest seasons of the year. It has a velvety plush feel that’s a must-have for every home. Pinzon Velvet throw blankets are made from high filament microplush- 100% Polyester. It is lightweight and durable and will last you for many years. This Velvet Plush Throw blanket comes in seven solid captivating colors: Aubergine, Burgundy, Chocolate, Grey, Ivory, Navy, Sand and Teal. 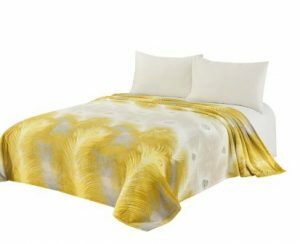 Pinzon velvet throw blankets will fit whatever bed size you have, they come in four different sizes: Throw (50″ x 60″), Twin (66″ x 90″), Full/Queen (90″ x 90″) and King (90″ x 108″). Nothing can beat this plush and velvety throw blanket when it comes to warming you up- it is perfect to use for the colder months. This plush throw blanket is made in OEKO-TEX Standard 100 factory- to ensure that the fabric used has passed the high safety and environmental standards. Caring for this posh blanket is easy- it ismachine washable for your convenience.